Discuss issues and news related to PIA, Pakistani airlines and Pakistan's civil & military aviation. 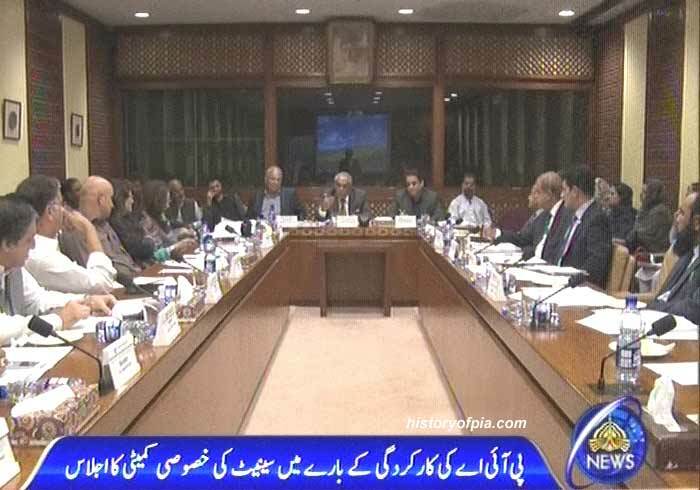 According to PTV News, meeting of a special senate committee to review PIA performance chaired today by Senator Syed Muzafar Hussain Shah formed a sub-committee to investigate sale/disposal of PIA Airbus A310-300 (AP-BEQ) through a German firm in violation of Public Procurement Regulatory Authority (PPRA) rules. Alleged role of then PIA Director Procurement & Logistics Air Commodore (Retd.) Imran Akhtar in this scandal will be investigated by the sub-committee. The aircraft is currently parked at Leipzig Halle Airport in Germany. Adviser to the Prime Minister on Aviation Sardar Mehtab Ahmed Khan Abbasi and Chairman PIA, Secretary Aviation and Chairman CAA Board Squadron Leader (Retd.) Muhammad Irfan Elahi at the meeting. Senate committee meeting chaired by Senator Syed Muzafar Hussain Shah. Central to all allegations about a plane that went missing and popped up in Germany is former Acting Chief Executive Officer (CEO) Bernd Hildenbrand. To recap: an Airbus-310 (A-310) that was owned by PIA was first rented out to a film company by Procurement Director Air Commodore (retd) Imran Akhtar, brother of former director general of the Inter Services Intelligence (ISI), Rizwan Akhtar. The plane was flown to Malta for the film company. The A-310 was a “fly-worthy” aircraft. And yet, with it having been taken out of service for filming purposes, it never returned to the PIA fleet. Three departments — Marketing, Finance and Corporate Planning — were entirely bypassed by the procurement director. And the plane itself landed in Germany, in Leipzig, to be displayed at a museum. Till recently, PIA had been claiming that the plane was never sold in the first place and it still had ownership of the plane. In truth, Akhtar removed Operations, Engineering, Marketing, Finance, and Corporate Planning from the loop and made the transaction without any kind of approval from the board of directors. The plane had working auxiliary power units, avionics and landing gears, among other parts. The film company offered 245,000 Euros for the aircraft while the German museum charged 45,000 Euros in marketing fees for displaying the aircraft in their museum. The issue was raised in a Senate sub-committee session. This was attented by Irfan Elahi, 13 senators including Muzzaffar Hussain Shah, Gen Qayyum, Farhatullah Babar, Mushahidullah, Sherry Rehman and others. Senator Saleem Mandviwalla took the dais with documents claiming that just the fuel cost incurred by the national flag carrier was far greater than the sum paid by the film company. While Bernd Hildenbrand is accused of having flown the plane to Germany, the role of Imran Akhtar has escaped public scrutiny. He could only have used and abused the aircraft if he had the permission of the Pakistan Civil Aviation Authority (PCAA) to do so. And he did: writing to the civil aviation, Akhtar asked for its de-registration from the aviation authority, even though that wasn’t his job to begin with. And to make matters more complicated, well-placed sources claim that influential quarters are now trying to have that letter expunged from the records so as to camouflage the act. How did he get away with it? Because at the helm of the PCAA is a friend: Irfan Elahi, also the chairman of PIA and the aviation secretary. As the clamour increased at home about where the A-310 had disappeared, an inquiry was set up to probe the matter. The inquiry report was finally penned by two officers, Legal Advisor Ahmed Rauf and Chief Internal Auditor Javed Mansha. They held Hildenbrand and Akhtar responsible for the fiasco, asking the latter why he initiated the loan and sale of the aircraft when he wasn’t authorised to do so in the first place. The probe report raised questions about why the three departments that should have been in the loop for the sale of the aircraft were bypassed. It also claimed that Public Procurement Regulatory Authority (PPRA) rules had not been followed and due process was bulldozed. In a statement issued by Senator Saleem Mandviwalla later on, the politician reiterated the claim that the A-310 had been sold without any award of a tender. “The market value of PIA’s A-310 was in millions of dollars but it was sold for just 5.3 million rupees,” he said. Notwithstanding the inquiry, the fly-worthy aircraft had been sold for the price of scrap. But after its sale, a tender was finally issued in Pakistani newspapers while the plane was parked in Leipzig. No potential buyer in Pakistan could physically inspect the plane. The advertisement wasn’t printed in German newspapers and that precluded any potential buyers in Europe. The bottom-line, however, was that a tender was issued on an asset that PIA didn’t own at that point. 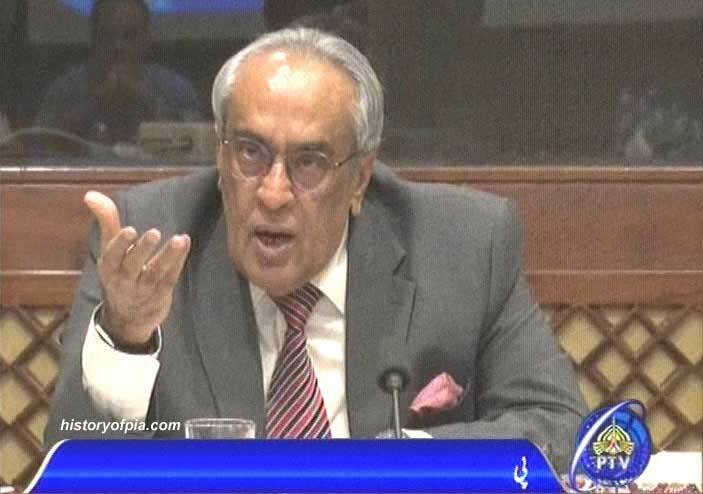 Such was the gravity of the case that the incumbent air chief, Sohail Aman, issued a statement declaring that if Imran Akhtar is indeed caught by the National Accountability Bureau or the Federal Investigation Agency, the air force would not stand by their man (who was in service at the time). A few days later, ISI chief Rizwan Akhtar resigned from service. The Ex German CEO gave a different story in Herald which was recently published. Forum colleagues have commented multiple times that it is not a one man's job. The gone CEO is conveniently getting the blame. This will be another mess which will never be cleaned up. The current CEO of Shaheen in a recent TV interview also mentioned Irfan Elahi's name multiple times for wrong doings within CAA and PIA. ISLAMABAD: A parliamentary committee on Wednesday decided to seek the prime minister’s assistance in bringing to justice all those involved in the PIA aircraft sale. “The prime minister has the powers to get the guilty individuals behind bars,” said National Assembly Standing Committee on Cabinet Secretariat Chairman Rana Mohammad Hayat Khan. In Dec 2016, one of the four Airbus, A310 aircraft, was sold to Leipzig Museum, Germany, without following procedures. The committee was informed that the German authorities were demanding more than 200,000 euros parking charges for the aircraft, including charges for altering a terminal at an airport. The issue of the sale of an Airbus A310 was taken up as a calling attention notice moved by JUI MNA Aliya Kamran in a recent National Assembly session. She asked why the aircraft was sold for only 47,500 euros. “The aircraft could have fetched more money had it been sold as scrap,” said Aliya Kamran. She also highlighted that the plane was used in an anti-Palestinian film which also hurt the sentiments of all Pakistanis. 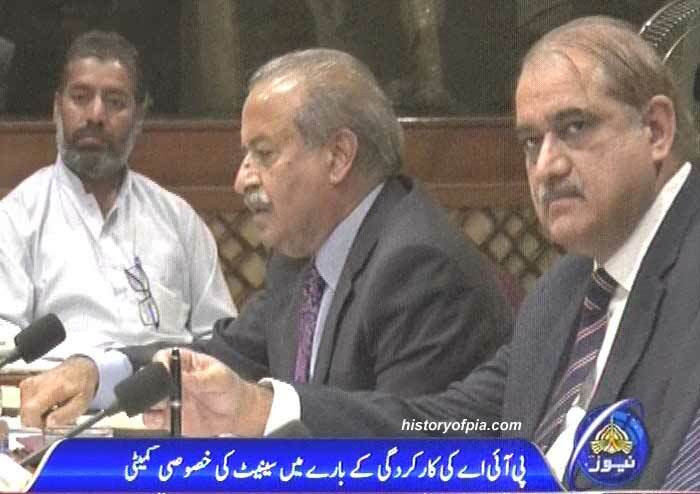 The meeting learnt that four Airbus A310-100 aircraft were inducted by PIA in 1993. After completing 20 years of service, PIA decided to offer these aircraft in open market by inviting tenders in July 2016, but the national flag carrier received no bid. The meeting learnt that former director Procurement Air Commodre Imran Akhtar proposed the sale of the aircraft and was approved by the then PIA CEO Bernd Hildenbrand. Bernd Hildernbrand, whose name was removed from the exit control list on the condition that he will be back within 30 days but he never returned, Joint Secretary, Aviation Division, Abdul Sattar Khokhar told the committee. Mr Khokhar informed the committee that PIA had agreed not to receive 47,500 euros, the price at which the aircraft was sold, and decided to pay it for the aircraft’s parking charges at the museum. “The sale price of the A310 was settled before advertising its sale. Advertisement for sale of the aircraft was placed after violations of Public Procurement Regulatory Authority (PPRA) rules were highlighted in the case. The PIA Board of Directors was not taken into confidence. The sale of the aircraft was the sole decision of the German CEO,” said Abdul Sattar Khokhar. Responding to a question about the PIA aircraft being used in a film, Mr Khokhar said a London-based company, Aviaction Ltd, had sought one A310 aircraft on lease for a movie to be shot in Malta. The name and theme of the movie were not conveyed to PIA. The plane was used in the film and shown as an Air France aircraft. After the shooting, the aircraft was painted in PIA livery and flown to Leipzig from Malta. “PIA received 210,000 euros for his charter,” he said. PIA Airbus A310-300 (AP-BEQ) is parked on a disused runway of Leipzig Halle Airport where it had landed one year ago on December 5, 2016. The aircraft's fate remains unclear. It will rot to death, if it has not already. Such a shame. Today the National Assembly was informed by parliamentary leader on aviation Javed Ikhlas. The PIA aircraft was sold illegally in 2016. It was sold to a museum in Germany. The aircraft was sold to the German museum for 47,500 euros. Former CEO PIA is involved in the case of this aircraft. On the demand of National Assembly members, the Speaker National Assembly Ayaz Sadiq asked for submission of report on aircraft sale. The report when received will be distributed to all members of the National Assembly, said the speaker. Official trailer of movie '7 Days in Entebbe' released. PIA Airbus A310-300 registration AP-BEQ was used in shooting of movie at Luqa Airport, Malta, before the aircraft was ferried to Leipzig Halle Airport, Germany. The PIA Airbus A310 appears as hijacked Air France Airbus A300 in the movie. What a shame for PIA. PIA Aircraft should not be used in any case. Why???? PIA got paid more money for the filming then the junk dealers of karachi would have paid. It looks like a really cool movie, love to watch it. You know what it proves, LOL PIA has the interior of a 1976 A300. What is the hang up Pakistanis have with Israel, we are not in war with them. Jordan and Egypt their neighbors have peace with them. Turkey our best friend has relations with Israel since 1948. If we were friends with Israel we could influence them over their treatment of the Palestinians but sitting outside we can do nothing. Think about it. The main issue is that apparently they sent the aircraft for movie shooting and later to Leipzig without proper procedure. No body could have raised objections had they sold this aircraft according to procedures and through proper completion of bidding process. This aircraft left Pakistan before the end of bids submission date. Airline's assets even if it's a small common pin should be sold by following proper rules & regulations. Illegal sale/disposal of assets should be discouraged and investigated. PIA bids invitation in December 10 newspaper to sell airline's Airbus A310-300 registration AP-BEQ parked at Leipzig Halle Airport, Germany. Pakistan International Airlines Corporation Limited (PIACL) invites the sealed offers for above mentioned aircraft on "As Is, Where Is" basis currently parked at Leipzig Halle Airport (LEJ), Germany. Handover of the aircraft structure to the successful bidder would be subjected to issuance of No Objection from the Leipzig Hall Airport authorities, Germany. The offers for the aircraft hull with landing gear and seats/avionics are to be quoted in figure and words as well. The prospective bidders have the option to combine the tender floated for the engines and auxiliary power unit (APU) of same aircraft and can give a single offer. PIA bids invitation in December 12 newspaper to sell two engines and an auxiliary power unit (APU) of airline's Airbus A310-300 registration AP-BEQ parked at Leipzig Halle Airport, Germany. Pakistan International Airlines Corporation Limited is pleased to invite the sealed tenders for below mentioned engines and APU on "As Is, Where Is" basis.